This black 25mm (1inch) badge has a delicious looking Cupcake in the middle decorated in hearts and with a Cupids arrow through the top. It's a cute romantic pin badge and one that would make the perfect Valentines badge. 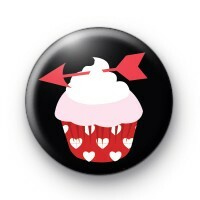 Our badges are such a fun, sweet way of showing that special person you love them or just that you love cupcakes. We have a really great selection of love and romantically themed badges and we even have some sassy Valentine's slogan badges too, so be sure to browse the Valentines category for lots more designs.